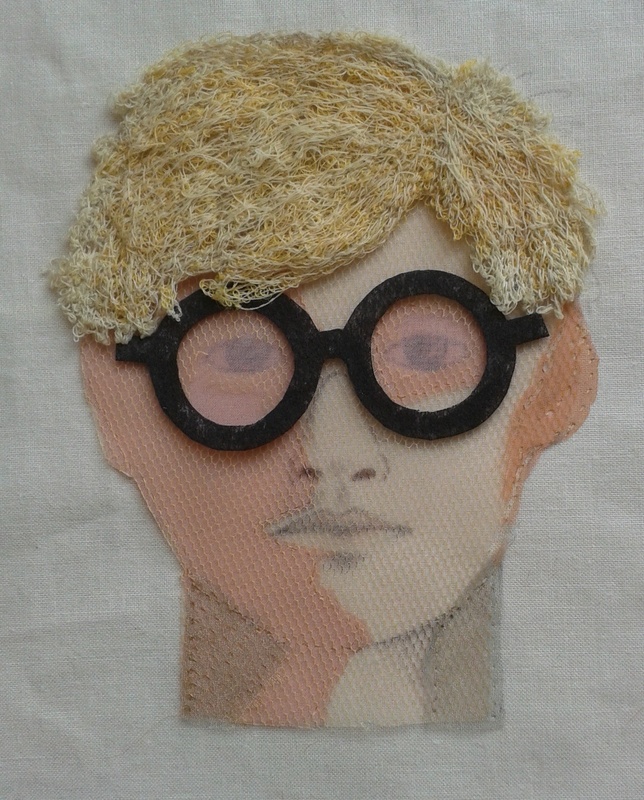 I want my version of Hockney’s collage ‘Self Portrait‘ to be a fun piece constructed from a mixture of materials and methods. The face is being built up with layers of synthetic fabrics, bonded together using an 18w Antex soldering iron. My first attempt was with a 30w iron and a fine point bit….it was awful! The fabric burnt and I couldn’t control the cutting edge as the iron was too hot and the point too thick. I took advice from Margaret Beal on her website and bought a lower wattage iron with an extra fine bit…..it’s a lot easier when you use the right tools! For the mop of blond hair I chose to use a technique which I originally saw demonstrated by Jan Tillett on Youtube. This involved free machine sewing onto water soluble stabiliser which was held in an embroidery hoop. 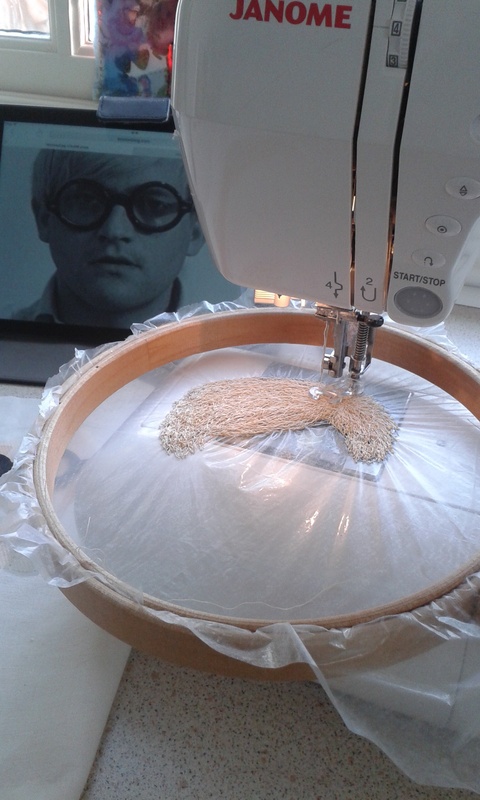 I traced the outline of the hair onto the stabiliser before sewing back and forth with yellow and cream thread, overlapping the stitches so that they held together once the background fabric was washed away. The hair took shape very quickly and I am really pleased with the texture. The next job will be to select fabrics for the clothes. Creating the hair using soluble stabiliser. The mop of blond hair plonked in place! ← LINQS David Hockney Challenge….. Thanks, I am really enjoying working on this piece…only wish there were more hours in the day!